Oct. 25, 2013 6:00 p.m.
Mayor Greg Krischke (back center) and RCMP Constable Lindsay McNab (front row in uniform) proudly pose with one of the groups of outstanding local youth at the second annual Leduc Mayor's Youth Leadership Awards. 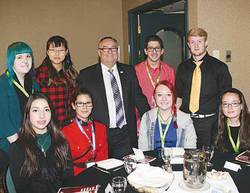 Almost 70 young people from grades 7-12 flooded into the Denham Inn on October 17th to be honoured for their efforts and leadership abilities throughout Leduc and County. The 2nd annual Mayor's Youth Leadership Awards recognize the uniqueness and individuality of the movers and shakers of tomorrow by acknowledging their contributions to society today. Members of the community including teachers, service clubs, group leaders and pastors had nominated each of these youngsters for their outstanding efforts, which were as varied as every person in attendance. Character – nominees are ethical, treat others with respect, are sincere, trustworthy (trusting of self and trusted by others), and place others before self. Service – nominees meet others’ needs, demonstrate positive peer mentorship, are empathetic, and demonstrate a desire to see others succeed. Leadership – nominees are good communicators, exercise good team-building skills, lead by example, and recognize opportunities to empower other youth. As the kids arrived they were greeted by an honour guard of RCMP and Firefighters lining the hallway, and then before entering the banquet room they had their photos taken by Mountain West Studios as a remembrance of the day. Each student was led to their table by a City Councillor and each table had a prominent community member seated with the kids to help facilitate conversation, answer questions, and after the luncheon, to hand out the awards. Just some of the community leaders in attendance were Mayor Krischke, City Councillors Dana Smith, Glen Finstad and David McKenzie, former City Councillor Judy Archie, Pastor Monica Prescott, Lawyer John Jackie, RCMP Inspector Wally Lynds, and Fire Chief Ernie Polsom. At the back of the room were hung four posterboards with unfinished statements printed on each one that encouraged the students to complete them in their own words. The first was "My Role Model Is…" and the hand written answers included "My parents", "My Nana", "My friends", and "My big brother". The second asked "Ladership Means To Me…" and the varied replies included "Helping out in the community", and "Starting a new path". The third posterboard read "I Lead Because…" and was answered with "I like to help people", "It's fun", and "It's important". The final one began with "I'm Inspired To Do…" and some of the finishing statements were "Anything that involves moving around", and "Lend a hand". After everyone had time to socialize and Pastor Landen Dorsch from Gateway Family Church said Grace for lunch, Mayor Krischke came forward to welcome all the kids by stating "I am proud to stand before you and recognize you for the people you are. You were selected because of your character, service, and leadership, and all of your nominators were eager to tell us about your contributions to this community. Leaders come in all shapes and sizes but the one thing that all leaders have in common is that they love their community and they are not afraid to show it! You are a catalyst for change." As one and all enjoyed a fabulous lunch of fried chicken and roast potatoes finished with a selection of chocolate parfaits for dessert, a series of four videos were played on the large screen at the front of the room. These were pre-recorded messages from local celebrities who each had a special message for the kids about what leadership meant to them. The first video was from Country music star Adam Gregory who said his idea of a leader was "Someone who sets a good example." He stated that for him, his parents are the best examples of great leaders as they taught him "respect, morals, and beliefs." Kavis Reed, the Coach of the Edmonton Eskimos stated that "Leadership is about establishing boundaries, guidelines and and being a moral compass. Humility is the strongest characteristic a leader can have." Ralph Kreuger, former Head Coach for the Edmonton Oilers shared that "Leaders need to be team players that serve other people. You are leaders in your community so make sure your principles and values are clear. Most important, be yourself." Finally, Carole Anne Devaney, news anchor with Global TV Edmonton explained that "A true leader empowers and constantly encourages others' success. Amazing leaders are not arrogant." And in closing she quoted Oprah as she said "Where there is no struggle there is no strength." As the videos ended and the tables were cleared, the table leaders began the award presentations by reading aloud what the nominators had to say about every student at the table. Up until this moment in time it had been kept a secret from the students as to why they had been nominated for this honour and who had nominated them. There were a lot of red faces around the room at that point, and even a few shiny eyes as each young person heard the glowing praise and varied reasons they were there that day receiving the awards. Whatever their reaction was, it was obvious that one and all were touched by the moment and the honour bestowed upon them. In closing, Mayor Krischke had all the students in the room recite a quote from Mahatma Gandhi, and the room resounded with the sound of young voices avowing…"I will be the change I want to see in the world!"